It’s olive oil giveaway time! I say this at least once a month: when you are making something where the oil is not going to be cooked, like this cheesy ricotta spread, you want to use the highest quality, only extra virgin, olive oil. 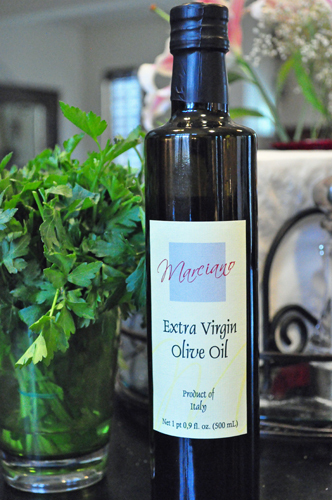 Thankfully, my generous sponsor from Gourmet Cooking & Living, those great folks who import small batch artisinal olive oils from Italy, will be offering a free bottle of this month’s oil… …Marciano’s Extra Virgin Olive Oil from Avellino, which is about 50 miles from the Amalfi Coast, to one lucky reader. Just comment below and tell me what spring dish you’ve been dying to get all winter long – I’ll pick a winner from the comments on Tuesday! 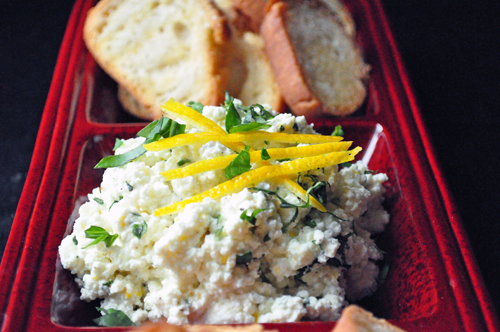 This ricotta spread is a great simple appetizer to whip up when guests pop over. Just serve it with some toasted crostini – or even some crackers if you don’t have a baguette on hand. 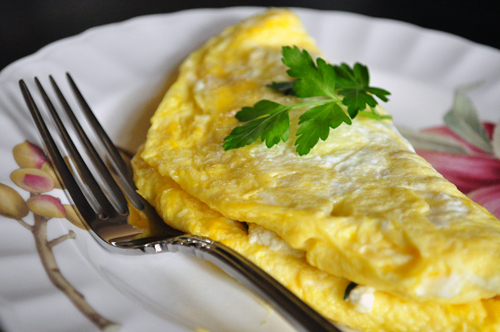 I had a little left over the next day and it made the perfect filling for a fluffy omelet – what a great way to start a Sunday! 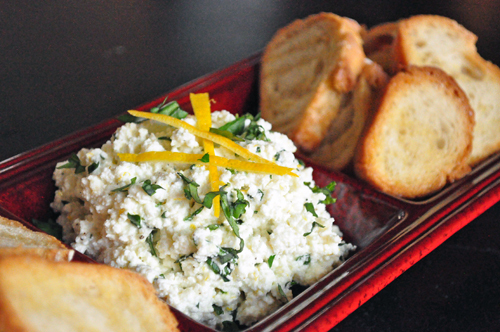 Lemon and basil and the finest olive oil give a kick to fresh ricotta cheese served over crisp crostini. Combine ricotta with lemon, basil and olive oil and stir together. Season with salt and pepper and cover; refrigerate for at least 20 minutes for flavors to meld. Meanwhile, lay baguette slices on a foil lined baking sheet and drizzle generously with olive oil, then sprinkle with sea salt. Bake at 374 degrees until golden brown, about 10-12 minutes. Serve crostini with ricotta spread. Don’t forget to check out the Olive Oil of the Month Club from Gourmet Cooking & Living if you want to receive fabulous oil like this every month! Cowboy salsa. Fresh, colorful, complimentary flavors make for a perfect spring picnic addition. Black eyed peas, white shoestring corn, avocado, tomato, cilantro, green onion. But What makes this dish is bright, flavorful olive oil mixed with red wine vinegar, cumin, lime juice and zest. I always add a dash of cayenne pepper 🙂 This dish gets raving reviews whenever I attend a summer get-together. “Wow! what is the recipe for this! ?” Forget the chips, you could eat it by the spoonful! Heather, I make a similar recipe and I agree it’s the best of summer in a bowl! I love it over eggs or chicken as well as with chips, or just as a side dish with a Mexican meal. Wow Michele! This is the first time I’ve checked out your blog. This is amazing. I have also started on a eat local in season type of journey. I started with Mark Bitman’s Food Matters and love how my eating and cooking choices have changed. Mind you – I have never been a cook and find cooking multi-tasking a real challenge but I’ll be sure to check out your site more often for new ideas. Sounds great. I love getting new recipes for delicious and fresh food. Thanks for sharing! Every year about this time, I start eagerly anticipating fresh asparagus. Unfortunately, living in upstate New York it’ll be another few months until the local stuff arrives. I always have grand plans for various dishes to make with the asparagus, but 90% of the time I just roast it with olive oil and salt because I really can’t get enough of it prepared that way. This oil is made very close to where my Mom is from! I agree that HIGH quality oil makes a huge difference. I’ve been craving stuffed artichokes all winter long! Found your blog on TasteSpotting . . . it is making my mouth water! I’ve definitely been looking forward to baking with strawberries. Strawberry cake, strawberry bread, strawberry cookies, strawberry EVERYTHING!